Insurgency first originated in the mind of Andrew Spearin during Canadian Army Basic Training as Operation Counterinsurgency, which would have been a mod for Half-Life 2, but later became Insurgency with the involvement of later-to-be New World Interactive CEO Jeremy Blum who co-created the game alongside Spearin. Blum, who was still in High School at the time, was one of the minds behind the highly successful Red Orchestra mod for Unreal Tournament 2004. Insurgency: Modern Infantry Combat released as a Half-Life 2 mod just two weeks after Half Life: Episode 2's release, and went on to win ModDB’s Player Choice Mod of the Year award in 2007. Six years later, Insurgency 2, eventually just called Insurgency, snuck its way onto the first wave of Steam’s Early Access program. Despite little money, support from Valve, and access to talent, the game’s sales eventually took off after full release in January 2014, eventually selling over 4 million copies as of 2017. The game’s development took a lot out of the studio, with development being on and off for six years, a failed Kickstarter campaign, and eventually costing a whopping four million dollars to develop, most of which Blum told me he raised by borrowing from family friends and other small investors. Just two years later, Day of Infamy, what was originally a WWII mod for Insurgency released into early access. The game was generally well received, but was nowhere near as successful as Insurgency, with the majority of sales taking place during the game’s Early Access phase. The game was heavily critiqued by many, myself included, for failing to innovate and distinguish itself from other games in the genre, despite still being quite fun. Insurgency was designed to fit the happy medium in First Person Shooters, trying to “find a middle ground between games like Call of Duty or Counter Strike and these larger scale, more realistic like Arma or Red Orchestra,” according to Blum. 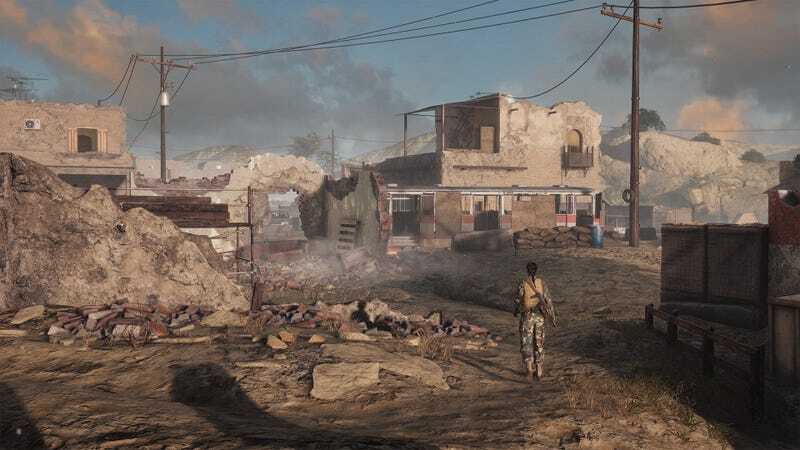 The game does just that, mixing elements of realism through short times-to-kill with sharp recoil while avoiding the walking-simulator gameplay many fans of sandbox titles like Arma are familiar with. While Insurgency succeeded in meeting the happy medium, there was plenty of space to improve and expand, which is exactly the plan with Sandstorm. Sandstorm is the first title in the series to include infantry combat, drivable vehicles with mounted guns, as well as air support which interacts with the environment. The focus of the game is infantry combat, which is why you won’t be seeing APCs or M1 Abram tanks in the game, but plenty of technical trucks and helicopters that can easily be destroyed by skilled players, while still having a significant impact on the flow of each match. The game is launching with four gamemodes in checkpoint co-op or three PvP gamemodes with both objective-based and attrition-based gameplay many fans of Team Deathmatch will be excited for. While PvP comes with the usual challenge of being pitted against real players, co-op isn’t any easier. Unlike many games where enemy AI is either too stupid too kill anything or too strong to beat, Insurgency: Sandstorm meets the happy medium once again. AI is challenging, with the reaction time of real people, but you won’t be shouting at your screen, questioning how a bot saw you from across the map. The game has a much more refined feeling to its gameplay but is still going to be very familiar to many fans. Gameplay is often slow, but there’s rarely a real lull in gameplay, as expert players can move quickly and efficiently throughout the maps. Much of the game still has a way to go though, as plenty of content is missing from the game such as weapons, the loadout system, and art assets. Additionally, the game has plenty of space to improve, with gamemodes like Firefight ending incredibly quickly if the teams are at all lopsided. Blum said releasing Day of Infamy in early access 2016 was a huge step down from Early Access 2013. Although New World Interactive had grown to over 30 full-time employees, development and feedback during early access did not help with development. When Insurgency released on Early Access, the game had a very small but dedicated fanbase regularly giving its developers feedback which ultimately led to the well-polished game seen at release. With Day of Infamy, feedback didn’t have as lasting an effect and many players were scared away from the game due to its unfinished state. According to Blum, it robbed them of the opportunity to take feedback and greatly improve the game for the people who could discover it later when the game was in a better state. In an effort to replicate that same dedicated feedback seen in the Early Access of Insurgency, all of Insurgency: Sandstorm’s feedback was from almost a year of closed testing from casual testers and many of Insurgency’s competitive playerbase. In the time since testing began, the game’s undergone many enormous changes. Just two months ago, during the game’s E3 build, ladders were removed from the game because they weren’t full implemented yet. Higgins let me try out a slightly later build of the game on his laptop which did have ladders, but trying to use them put your character model into a T-Pose and made the gun I was holding unusable. Testing the closed beta build released this morning, those bugs are gone and the game is a completely different beast in terms of performance and animations. The game isn’t feature complete though, with Higgins promising character models and some animations are placeholder. That’s really good news to hear since the current character models look even less than lifeless. Unlike previous titles, Insurgency: Sandstorm is on the Unreal Engine 4 as opposed to the much more dated Source engine. This has opened up tons of different opportunities for the game, because actions as simple as vaulting, opening and closing doors, or climbing ladders wasn’t possible in a fluid way on the source engine. In the end, video games live and die with the production of content; its why games like Call of Duty 4: Modern Warfare or Dwarf Fortress have way outlived their expiration dates: modding and content patches. Despite Insurgency being released in 2014, development of the game continued well into late 2016, with new gamemodes and adjustments to map design being released regularly. New World Interactive is a company made of skilled mod-makers who decided to make their own games, and do they put a lot of time into highlighting the effort that goes into making mods. Mods with as much depth as total-conversions are common for both Insurgency and Day of Infamy, with Community Manager Alex Blonski hosting an over hour-long Q&A stream with the developers of a total conversion mod for Day of Infamy just last week. Despite Insurgency: Sandstorm moving to the much less moddable Unreal Engine 4, Blum told me back in December 2017 that the game would still receive full mod support. With the release of Sandstorm coming next month, its worth watching how the game changes up to release and seeing how it evolves in the coming months.